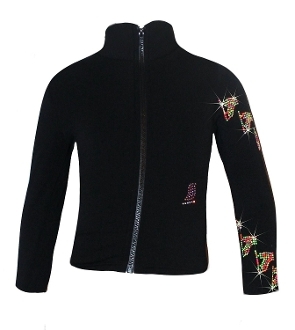 The Ice Fire Fleece Skating Jacket features sparkly rhinestones swirls around the left sleeve in a Spiral Skates pattern. Choose from Crystal Design with over 600 AB rhinestones or Neon design with over 600 AB crystals and colorful rhinestuds. Fitted style without the hood, make this jacket ideal for ice skating practice. Available in Child XS - Adult L. Click on images to view sizing chart. Ice Fire can take 4- business days for delivery.